The results of the presidential elections held in Kenya on 27 December 2007 were heavily contested by the two main political parties, the ruling Party of National Unity (PNU) and the opposition Orange Democratic Movement (ODM). The election results were announced on 30 December and the incumbent President Mwai Kibaki was hastily sworn in as the President of the country amid protests from the ODM leader, Raila Odinga. The Chairman of the Electoral Commission of Kenya (ECK), Samuel Kivuitu, confessed after the fact that he was not certain who had won the presidential election. There were therefore grounds for ODM to contest the results of elections but PNU also continued claiming that it had won the election legitimately. The tension created by this dispute further fuelled the violent protests that afflicted the country in the early months of 2008. 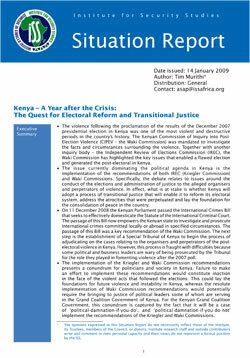 Specifically, the political disagreement over the outcome of the poll led to the outbreak of sporadic and widespread violence across Kenya which affected communities in the low-income areas of the capital city of Nairobi, as well as in key urban and rural centres, including Mombasa, Kisumu, Eldoret and parts of the Rift Valley, Nyanza, Western and Coastal Provinces. Over a six to seven week-period, an estimated 1,200 people were killed in the violent clashes that ensued and approximately 350,000 people were internally displaced as a direct result of the violence.